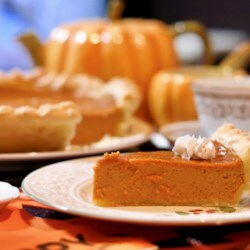 This is the best pumpkin pie recipe! I get rave reviews on it every year. I always use a ready-made graham cracker crust, and it comes out great. One suggestion is to let the pie cool on the oven rack, because it cools more slowly that way. If you take it out onto the kitchen counter, the filling sometimes cracks because of the cold air.